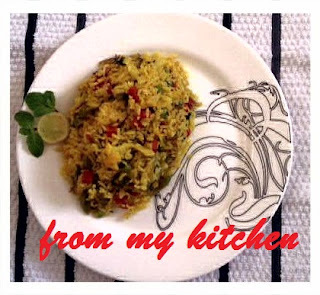 The recipe is from Master Chef India Cook Book - by Pankaj Bhadouria. I am a big fan of her. She is my inspiration. It was awesome in taste, my mother and my husband just loved it. Hope you will love it too. Wash the rice and soak it for 30 minutes. Heat 1 tbsp of ghee in a pan and fry the sliced onion till golden brow an remove to a plate with a spoon. In the same pan, sauté half the sahi jeera till they begin to sizzle. add 2 cloves, 1 cinnamom stick, half the mace, nutmeg and peppercorns till fragrant. Add the ginger-garlic paste and sauté it for 1 minute. Now add the vegetables and cook it for 2-3 minutes over low flame. Add salt, pepper and the yoghurt and cook till the vegetables get tender. In a large pan, boil 4 cups of water with 1 tsp salt. In a piece of muslin cloth tie the remaining cloves, cinnamon stick, mace, sahi jeera, black cardamom, green cardamom and add to the water with the bay leaf. Cook the rice till half done and let all the flavors infuse into it. Drain the rice and reserve the strained water. Add the remaining ghee an mix with the help of a fork to the rice and keep aside. Now to assemble the biryani, take a deep base Handi and spread half of the fried onion then half of rice over the onion. Add the vegetables and again a layer of rice along with the chopped mint leafs. Cover the top with the remaining fried onions. Sprinkle Kewra water on top of it. Pour 1 cup of the strained water and cover the lid and allow to cook for more 3-5 minutes at a low flame. 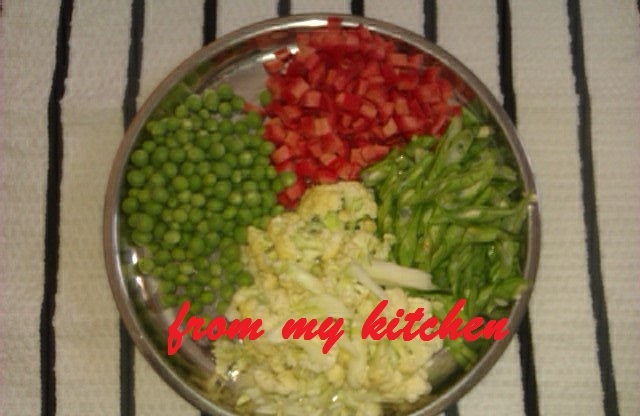 I see you have made the biryani so colorful with all those lovely vegetables. Thanks for linking it to the event.